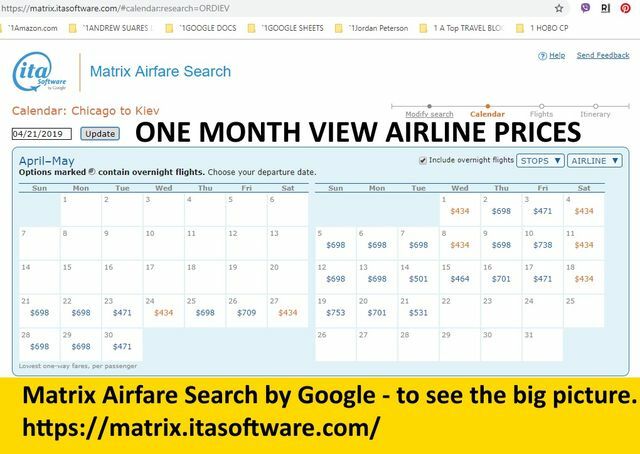 Matrix Airfare Search By Google a way to see a month of prices in one view. Not the best way to find deals, but a great way to understand which days of a month have cheap airline tickets. Members of Hobo Traveler give advice, hints, on best protocols for buying airline tickets. An example of how a normal tourist buys airline tickets. 1. First, they arrange for a vacation from work, normally starting on Friday evening, and returning on a weekend. 2. The date, day, is locked in, they have almost no options. 3. The airlines love this, between tourists, and business travelers who have zero choice on when they purchase airline tickets, the airlines make the bulk of their profits. 4. They offer up cheap flights, to tempt you to purchase, fully aware only the pro travelers can buy the cheap tickets. An example how a pro travelers, Hobo Travelers buy airline tickets. 1. Pros, Hobos think of the big picture, airline tickets at Christmas are more expensive because everyone is returning home for Christmas. 2. We understand that need drives up prices, we know that flying on Friday, Saturday is generally more expensive then flying on Wednesday. 3. We know, that we must try every day of the week, to find cheap prices. 4. We know that some days in a month are cheaper than others. 5. We use systems like Google Flight Matrix to find cheapest days in the month. 6. We would arrange with the boss days off when flights are cheapest. Before we purchase, we Hobo It. Pro Travelers, Hobo Travelers know, they are sure, there is always a better way to buy airline tickets. Yes, for short flights from New York City to Boston, there are not going to be many options. However, long flights for example from New York City to Thailand, there can be many innovative ways to buy airline tickets. Use Google Flight Matrix. use Kayak.com, 3 day before, 3 days after search, do your due diligence, find your best prices, best plans, do the best you can. Then places you plans into the Hobo Travel Talk Wall, and allow Pro Hobo Travelers to help you brainstorm. Learn how to live the good life, join Hobo Traveler today. Google Search Matrix is only one tool, there are 1000's of ways to save on travel, and just one good idea can save you 1000's of dollars. Pro Hobo Travelers save money, tourists spend money believing they got the best deals, when in reality, they are the major profits sources of airlines. Pro traveler, Hobo are going to live the good life at one half the price, because we share our ideas, our plans, our dreams on the Hobo Talk Wall --- Before we buy airline tickets, not after. Go now to Google Search Matrix.